Since it is the female portion of the flower, the pistil is also referred to as the gynoecium (“female house”). There are three varieties of gynoecium: ((1) unicarpellate (sometimes called a “simple pistil), (2) syncarpous (“compound pistil”), and (3) apocarpous (“multiple pistil”). Plant anatomy is blessedly simple. Essentially, a plant has just three organ systems –roots, shoots, and leaves. (I think that’s the punch line of a joke, about a basketball player with a lot of team spirit, who is nonetheless in a hurry to go home.) Everything else is just one of those, modified. Thus the flower can be regarded as a compressed stem upon which the sepals, petals, stamens and pistil are modified leaves. The basic unit of the pistil is the carpel –a modified leaf that produces seeds along its margin. Imagine an ancestral pre-angiosperm plant with flat parallel-sided leaves bearing single-file rows of seeds along their edges. Now visualize the sides such a leaf folded upwards to meet each other, with the seedy margins fused to form a single upper margin. Thus is created a chamber with the seeds trapped inside. The midvein becomes the bottom edge of the chamber. This represents the simplest type of gynoecium, one formed from a single carpel, accordingly termed a unicarpellate gynoecium. 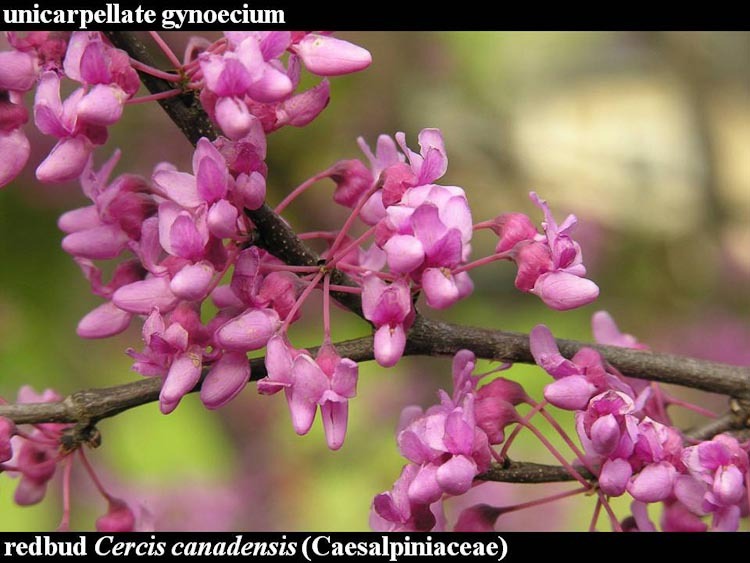 SLIDE the image to see redbud in flower. Redbud fruits. Note the single marginal row of seeds. Yippee, it’s strained analogy time. Here goes: Think of a unicarpellate gynoecium as being like a one-room shack. Then the more intricate (and more common) syncarpous gynoecium is like a house with several rooms. 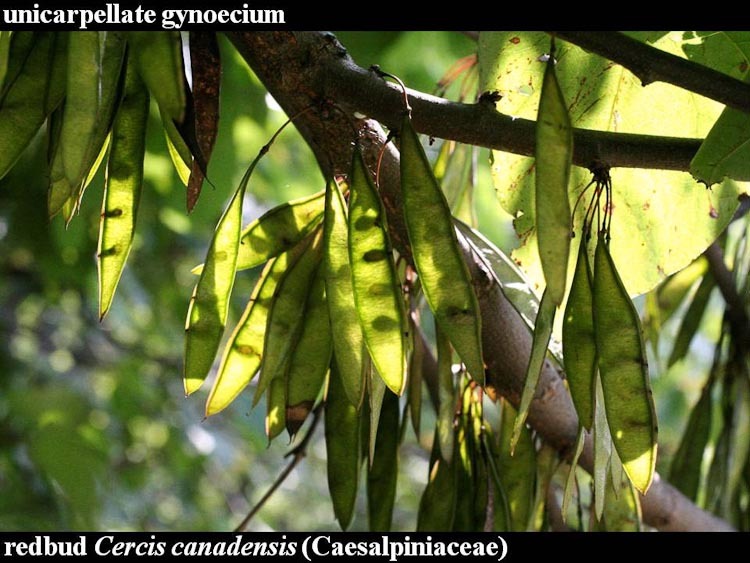 Depending upon the species (usually it is a family-level characteristic) syncarpous gynoecia most often consist of two, three or five carpels fused into a single unit. 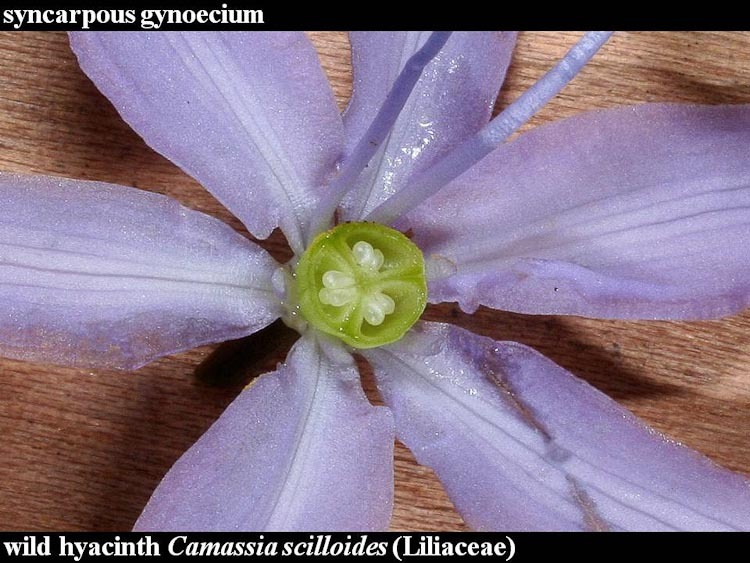 When in flower, clues that a gynoecium is syncarpous (and how many carpels it comprises) can be gleaned from counting a flower’s stigmas or stigma-lobes, or looking for ridges on the ovary that correspond to the edges of fused carpels. A cross section of the ovary, in flower or in fruit, will often reveal some definite number of partial or complete individual chambers, or at least separate rows of seeds, indicating carpel number. Below, wild hyacinth. 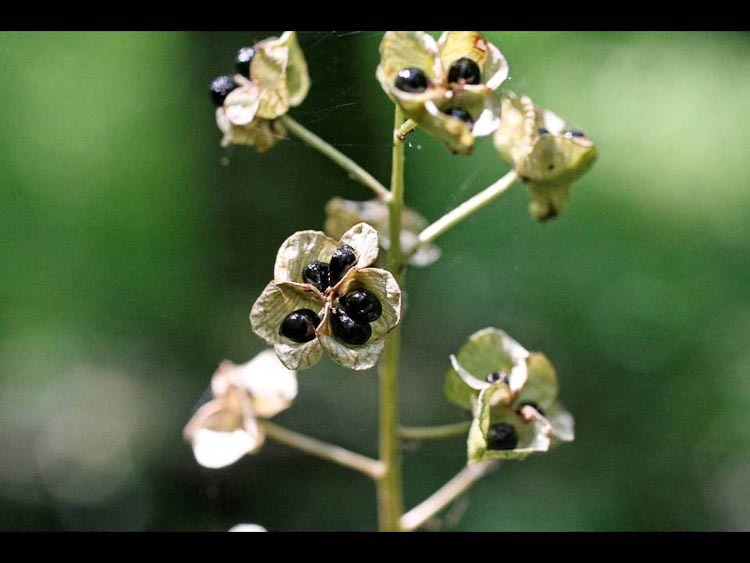 This spring wildflower is abundant in rich woods and also prairie remnants in central Ohio. MOUSEOVER the image to see an ovary cross-section. 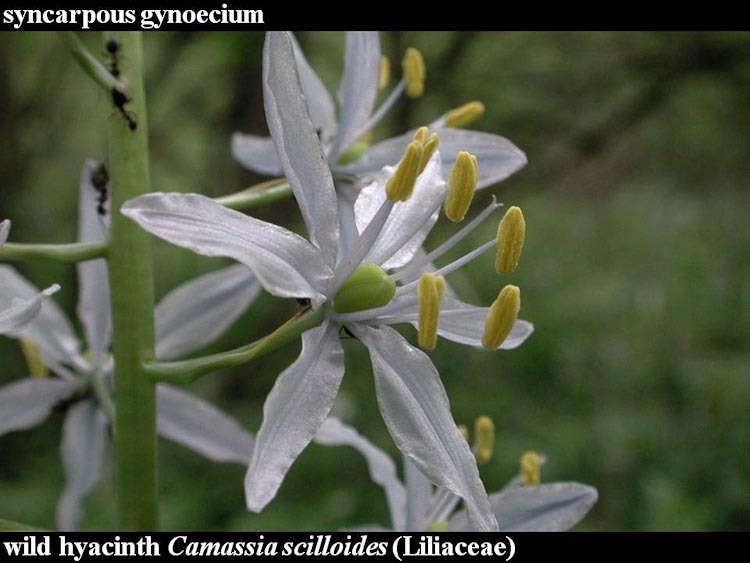 Wild hyacinth has a syncarpous gynoecium consisting of 3 fused carpels. Here’s wild hyacinth in fruit. If the unicarpellate gynoecium is a one-room shack, the syncarpous gynoecium a several-room house, then the apocarpous gynoecium is a small tract of land with several one-room shacks on it. Several separate stigma+style+ovary units are perched together on a single flower. This makes it possible for one flower to give rise to more than one fruit! Above, the student-carpels have fused together along a central axis to form a syncarpous gynoecium with three locules, each containing balloon ovules. Presto, from people to pepo! Below, tulip tree. This is a magnificent forest giant, producing easily worked, knot-free lumber that is marketed as “yellow-poplar.” (That is a misleading name, since it is not closely related to poplars, aspens, and cottonwood). It’s not related to tulips either. It’s more like a magnolia. 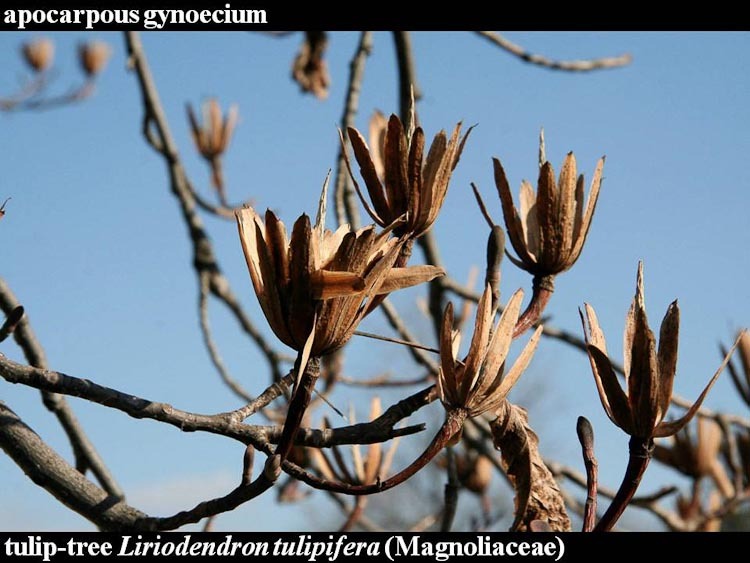 SLIDE the image to see tulip-tree fruiting. Flower parts are produced from bottom to top in the order: calyx, corolla, androecium, gynoecium (pistil). In many instances they clearly appear to be in that orderly arrangement as well. 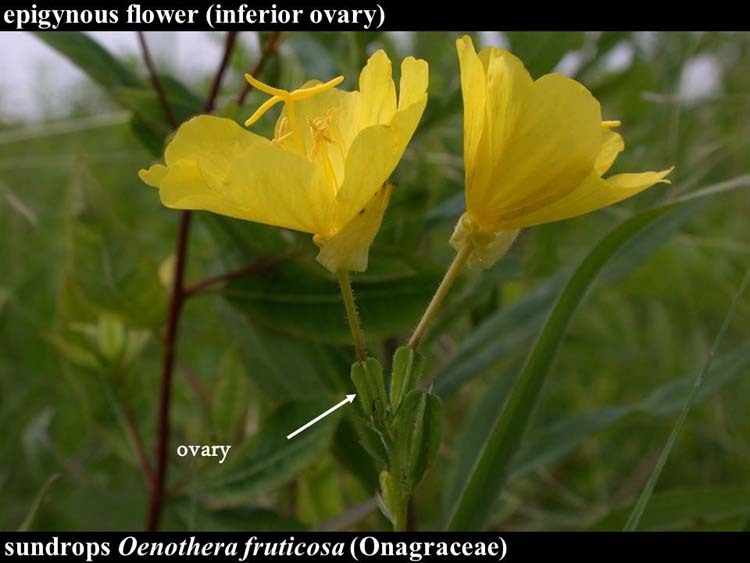 There is variation, however, in the manner in which the parts actually rise off of the flower, resulting in three categories of “flower type and ovary position” describing how the parts are positioned with respect to the all-important ovary. There are three such categories: (1) hygogynous with a superior ovary, (2) perigynous with a superior ovary and (3) epigynous with an inferior ovary. Below, bloodroot. This early-spring wildlflower neatly demonstrates a HYPOGYNOUS flower with a SUPERIOR OVARY. The sepals (which have fallen off), the petals, and the stamens are separate from one another and they are inserted, and rise off of the flower, beneath (“hypo”) the pistil (gynoecium). The ovary position is termed “superior” because it is located above the other flower parts. 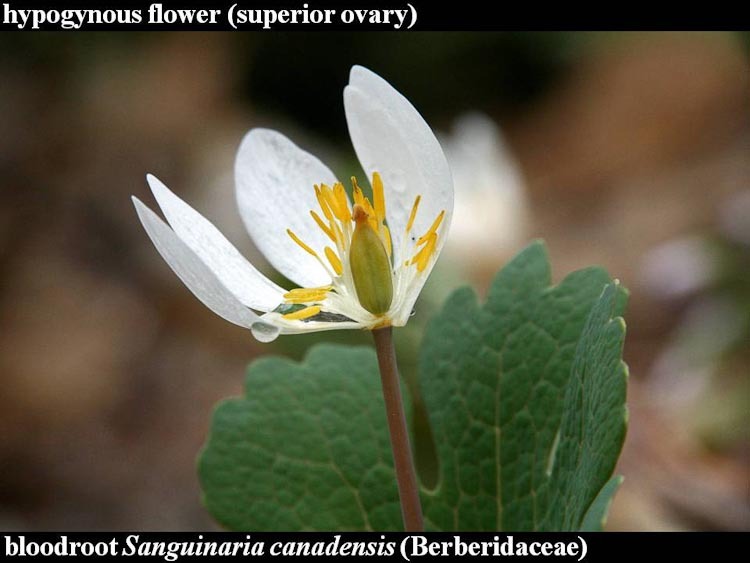 The bloodroot flower is hypogynous with a superior ovary. Some flowers, particularly those of the rose family (Rosaceae) are PERIGYNOUS, also (like hypogynous) with a SUPERIOR OVARY. 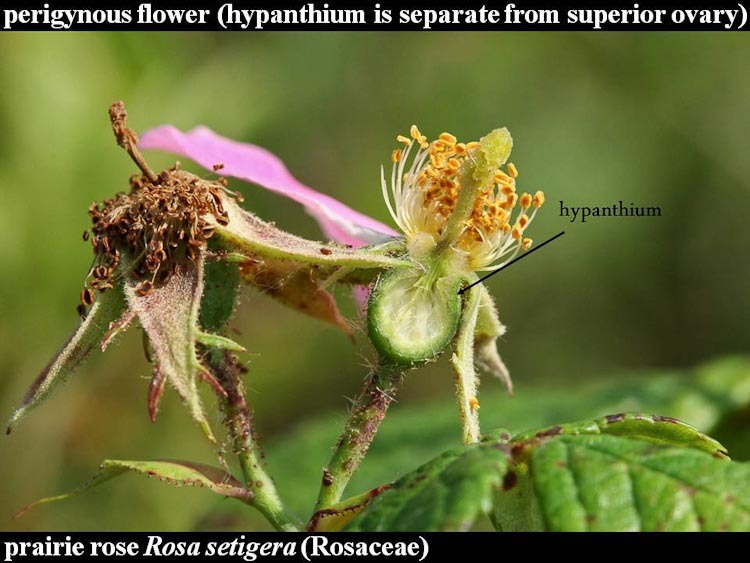 Here (and in the epigynous flowers described below), there is a special stucture, a hypanthium, also called the “floral cup,” that consists of the lower portions of the sepals, petals, and stamens fused together for a short distance. The individiual sepals, petals, and stamens rise off of the flower along the rim of the hypanthium, around (“peri”) the pistil (gynoecium). Imagine a ping-pong ball in a teacup. The ball is the ovary; the cup is the hypanthium. Because the actual attachment point is still below the ovary, the ovary position here is superior just as it is in hypogynous flowers. Below, black cherry. This is a native hardwood tree that produces a prized cabinet wood. Shade-intolerant, it grows in old fields and is one of the earliest trees in secondary succession to a forest. 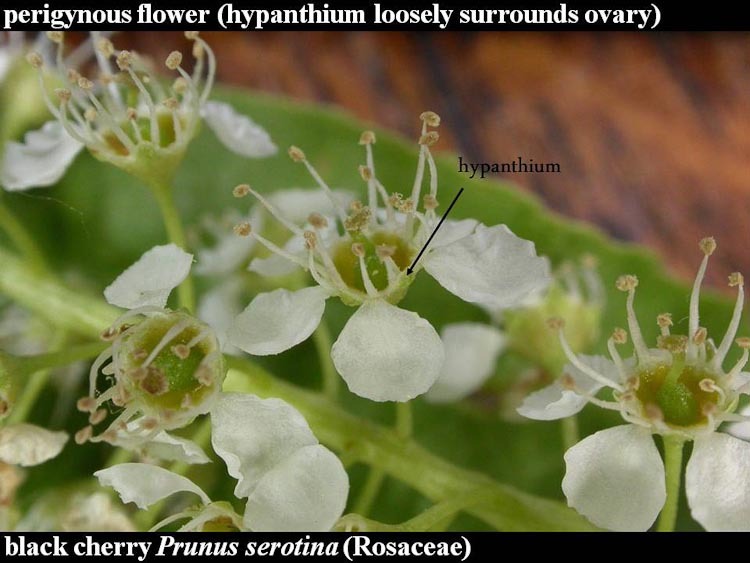 Black cherry flowers are perigynous withy a superior ovary. 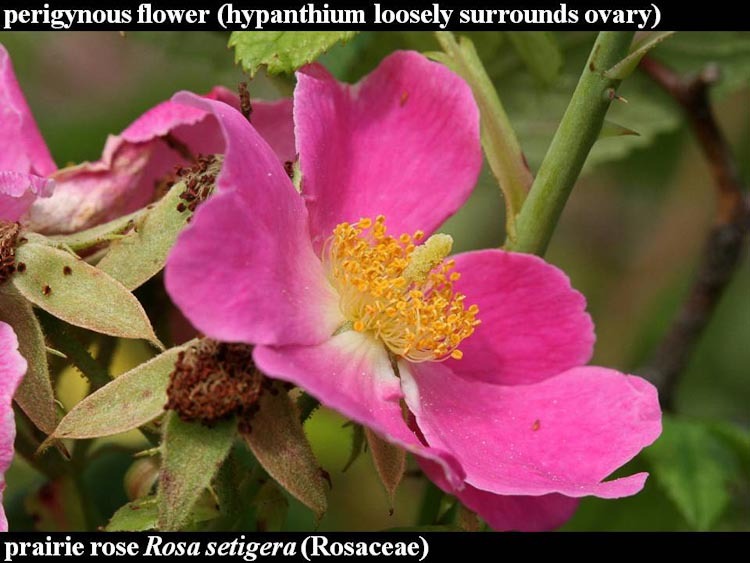 Roses have an unusually well-developed hypanthium that is fleshy, called a rose “hip.” The rose flower, in addition to being perigynous, is apocarpous,with many one-seeded carpels surrounded by the hypanthium. The rose flower is perigynous and apocarpous. The hypanthium is fleshy (called a “hip”). 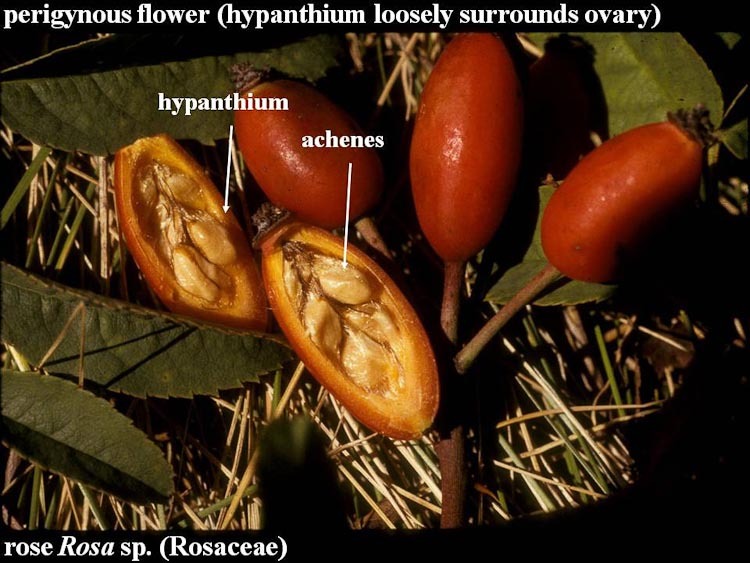 The rose flowers many separate carpels mature into dryish one-seeded fruits called “acehenes.” Here’s a mature rose hip, in cross-section, showing the fleshy hypanthium surrounding achenes. If a perigynous flower is like a ping-pong ball ovary in a teacup hypanthium, then the epigynous flower is instead like a glue-covered tennis ball jammed forcibly into the teacup. A hypanthium (floral cup) is present, but it is tightly fused to the ovary. 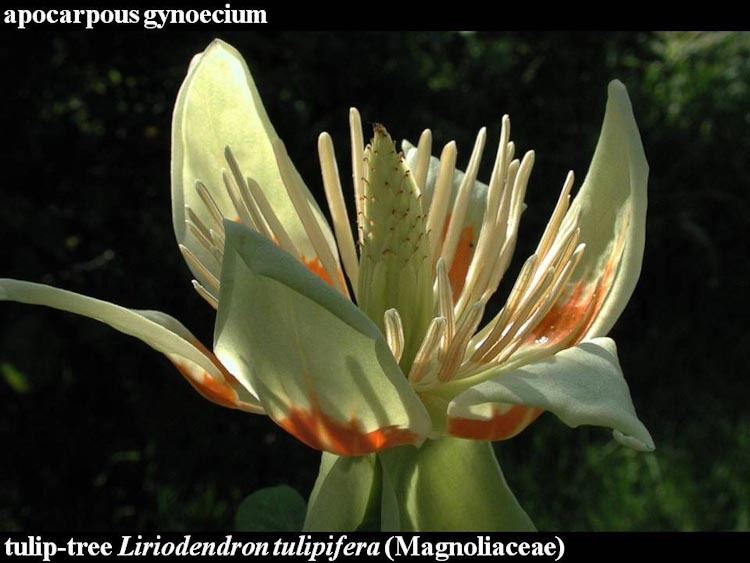 Hence, the other flower parts (sepals, petals, and stamens) are attached above (“epi”) to the gynoecium. The ovary position is termed “inferior” because it is situated beneath everything else. Below, sundrops. This lovely native prairie plant is pollinated during the daytime by a variety of bees and butterflies. Evening-primose flowers are epigynous with an inferior ovary.